My friend Karen from FamilyStyle Food recommended it, a simple rice cake (or in this cake, a corn cake) with a little peanut butter. It's perfect for an mid-afternoon pick-me-up or a supper-won't-be-ready-for-an-hour snack. I like both these products. The corn cakes taste good, better than I remember rice cakes tasting. 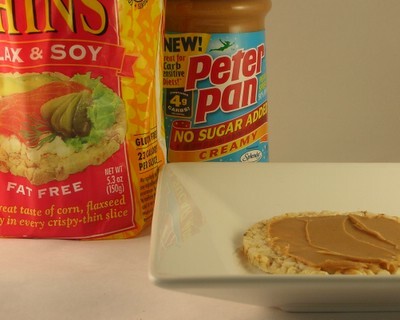 And I love-love-love the new Peter Pan no-sugar-added (and thus low carb, just 2 grams of carb per tablespoon) peanut butter. It's got more calories than my usual Peter Pan or Jiffy reduced-fat peanut butter but is so much more peanuty-tasting and satisfying. It's terrific for breakfasts all winter long, in my famous (?!) oatmeal. FROM THE ARCHIVES Occasionally I feature no- cooking-required convenience products in the Recipe Box. A YEAR AGO I experimented with cucumber pancakes from a blogger I'd not yet met but now am lucky to see often. Can you guess who it is? Just see! Spread peanut butter on corn thin. If needed, transfer to a plate. Enjoy. It does sound like a great lunch. I still can't find that peanut butter here, darn! I think I better fill out one of those cards and request it. Peanut butter on a rice cake is a great snack. But it just seems strange that the no-sugar added peanut butter has more calories than the regular peanut butter. It makes you wonder. Mia ~ It's been a long time since I've purchased regular peanut butter so my comparison is between the REDUCED FAT and NO SUGAR ADDED products. So perhaps, not so strange? Those corn cakes are really good! Way better than rice cakes in my opinion - and good for you! I like mine with a little flavored cream cheese! Yum. This sounds like a great afternoon snack. Have you thought of using the kind of peanut butter that is just peanuts and salt? I have my Trader Joe's PB in front of me and it is only 100 calories per tblsp 3.5 g carbs. It's organic and made with Valencia Peanuts. Whatever those are. It tastes very peanutty. Just a thought. It's obvious I'm new to blogging isn't it? Karen ~ The corn cakes are really good, they were just one of a thousand choices at Dierbergs. Nope see, just operator error! Comments work. Thanks for getting back to me. I will be trying that famous oatmeal! Ellie ~ What a great idea for work, for sure! It'd be good for long car trips, too. I seem to be in the car with my Dad often and he always wants to stop, for practical reasons, at fast food places along the freeway. Tanna ~ Whew! I just finished this morning's bowl of famous oatmeal. I dooo recommend it! My Dad and my sister's boys also like to stir in some chocolate chips. Talk about an indulgence, it's like chocolate chip peanut butter oatmeal cookies for breakfast!